Can you believe it's August 10th already? Where has the summer gone? Seems like the kids just got out of school and now it's time to think about school supplies and clothes to return. Time flies. http://theresmagicintheair.blogspot.com, which I had intended to enter this card into, but besides using the image, you were supposed to use sewing on your card. And I completely forgot, but this was such a fun image to color up, I'm okay with just showing it to you all. The papers are from a DCWV stack called Flower Shower. The border punch is Martha Stewart. The little flowers are stickers form K and Company. The sentiment stamp is from the dollar bin at Michael's. Circles were cut from colluzzles. 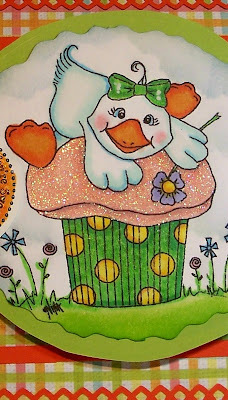 The cupcake frosting is glittered with sparkly white glitter. You know, this might be refreshing at first, but after the humidity kicks up.... Ducky is going to need a shower, lol!! 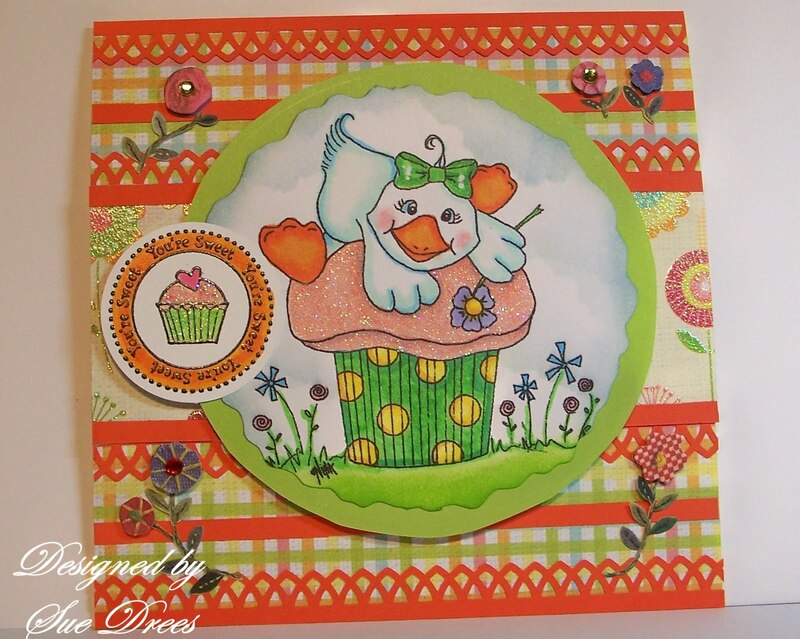 Love the fresh, fun colours and the image is really cute!! I hope you are staying cool. Get any rain yet? It STORMED everywhere in Kansas but Derby today... Weird. This is such a cutie Sue! I love the bright and vibrant colours! Such a great summer card! Great job!!!!! How cute is that card??? Love the image, I'm hopping over there right now to check it out. I have never used a digital image before and if this one is free, it would be a good time to try it out! Thanks Sue! This is so sparkly, bright, and cheery! Great card, Sue! 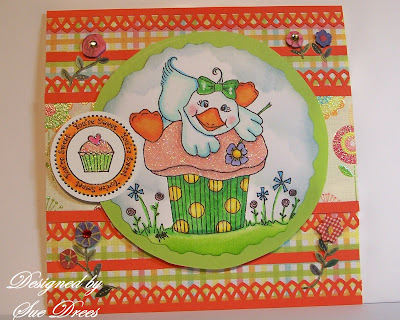 This is such a happy card and a "riot" of colors! So cute.